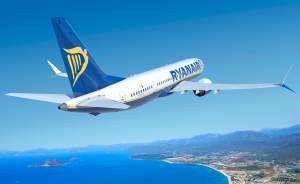 Ryanair operates a fleet of over 450 Boeing 737-800 series aircraft, with orders of up to 210 new Boeing 737 aircraft, this includes 135 new Boeing 737 MAX 200s, and options for 75 more MAX 200s, which will enable Ryanair to grow its fleet to 585 by 2024, further lower its fares and grow traffic from 142m customers last year to 200m p.a. in 2024. The average age of the Ryanair fleet is approximately 6.5 years, and is set to get younger with the latest aircraft order. Premium Seats Available Row 1 : Extra leg room, quick exit. Row 2-5 : Quick exit. Row 16 & 17 : Extra leg room.